The market leaders in a head-to-head comparison. 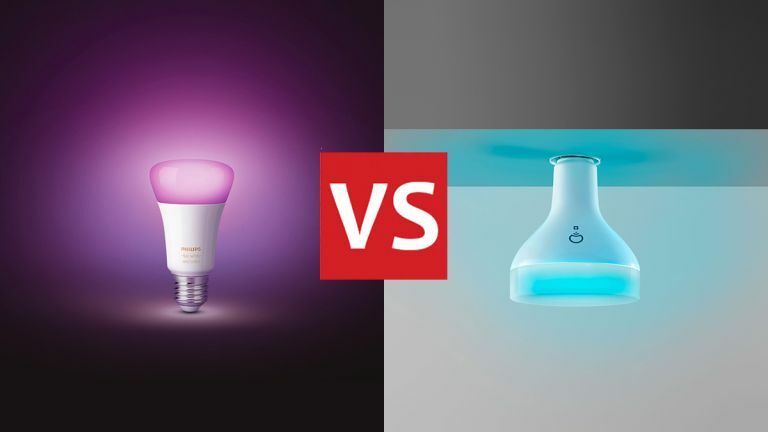 Which is better, Philips Hue or Lifx? When it comes to the best smart lights, you want bulbs you can rely on – having your kitchen light turn off in the middle of dinner, or seeing your living room lamp take on a mind of its own with colour cycling, isn't the sort of behaviour you want to see from your smart tech. It's fortunate then that there are some very competent smart lights on the market at the moment, and most of them are made by either Philips or Lifx. Here we're going to compare the specs and the features of the two big brands so you know which bulbs you should pick. There are only so many ways to design a lightbulb, and yet both the Philips Hue and Lifx ranges manage to add a touch of class and elegance to the appearance of their bulbs. You're not going to want to hide away any of these bulbs once you've got them fitted. The Philips Hue range is a little more diverse than the Lifx one, with light strips and standalone lamps to go alongside the colour and non-colour bulbs. Lifx sticks mainly with bulbs, though there are plenty to pick from – covering indoor, outdoor and security use. More recently, Lifx has started to add more separate lights, including strips and tiles, and these are just as stylish as the individual bulbs. In fact, we'd have to say that Lifx just edges it in terms of the funkiness of its designs, though Philips Hue lights are by no means ugly. If you don't want to control everything through your phone (or a smart speaker), the Philips Hue range also includes physical dimmer switches (to fit to the wall) and tap switches (to sit on a desk). There's also an official motion sensor accessory. One of the key differences between Philips Hue lights and Lifx lights is that the Lifx bulbs connect straight to your router and your Wi-Fi. If you get set up with a Philips system, you need to buy a separate Hue Bridge that plugs directly into your router and controls everything from there. With that out of the way, the basic features are the same between the two ranges – lighting control from your smartphone, whether you're turning bulbs on and off manually or setting a schedule for when everything happens. Colours can be easily adjusted, and bulbs can be grouped into rooms. You get a few extra features too: Philips Hue lights, for example, can be synced to whatever's showing on your TV or laptop screen, which is perfect for movie night. Lifx, meanwhile, offers a feature called Effects, which cover simulations like candlelight and a strobe light, and which you don't get with Philips. As for other systems and apps, both Philips Hue and Lifx are compatible with IFTTT (If This Then That), Apple HomeKit, Amazon Alexa, and Google Assistant – so no matter how your smart home is set up, you should be able to get your Philips Hue and Lifx bulbs working seamlessly with everything else. Both Philips Hue and Lifx offer apps for Android and iOS as you would expect, and both are sleek and simple to use – the Philips Hue one was recently revamped, which helps, but we slightly prefer the colour picker in the Lifx app (it's a more precise colour wheel rather than a palette blob). Tasks like grouping bulbs and setting timers are easy to do in either set of apps, but again the Lifx apps seem to have the edge (to us at least) in user-friendliness. There's not much in it though, and your mileage may vary. Take a browse around the Android and iOS app stores and you'll notice a lot of third-party apps that can plug into the Philips Hue and Lifx systems too – apps that can do cool stuff like make your lights respond to the weather. We'd say there are more apps that support Philips Hue lights than Lifx lights right now, but some support both. There's a good reason these two brands tend to dominate lists of the best smart lighting products: they both offer some very good bulbs, with lots of functionality, and accompanying apps that are a pleasure to use. You're going to have a lot of fun with your smart lights whichever option you end up going for. That Hue Bridge is obviously a factor in any purchasing decision – it's an extra expense and an extra bit of hardware. If you just want to get started with one or two bulbs, then the Lifx models might be a better bet. On the other hand, the Philips Hue range is bigger overall, so is more suitable if you're going all-in on the smart lighting. In terms of what you can actually do with your bulbs, it's pretty even too – Philips Hue just slightly has the edge here, because of the extra third-party apps and the experiments in Hue Labs, but Lifx also covers all the basics and then some. Integration with the likes of Amazon Alexa and Google Home is solid across the board. We think the Philips Hue system just about edges it – it's been around the longest and brings with it the most features and the most bulbs. Lifx, the lean and slick challenger, has a lot to offer too though, and is definitely worth careful consideration as well.